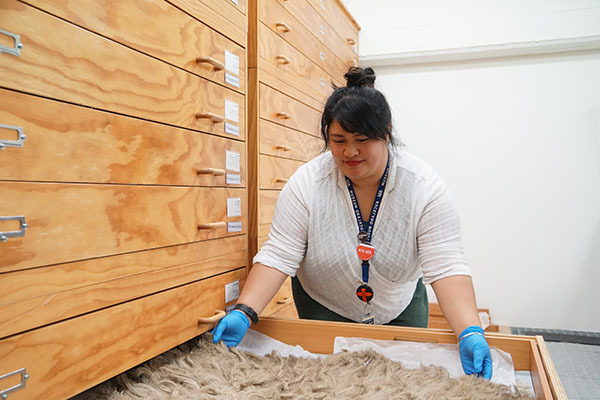 The Pacific Collections Access Project team is made up of Collection Technicians, Community Engagement Facilitators, a Project Conservator and Storage Technician who care for the incredible variety of Pacific taonga housed in the Museum. 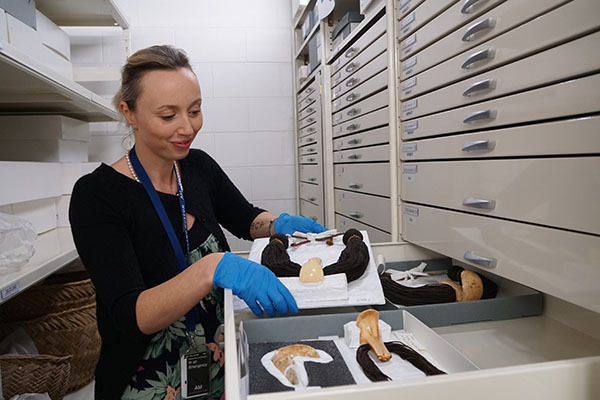 Over the past 3 years I have been on an incredible learning journey in my role as Collection Technician for the Pacific Collection Access Project. My day to day tasks of describing and cataloguing the diverse collections we cover in the project have only increased my love for Moana cultural heritage and my desire to enable our Moana communities access to taonga/measina in our museum and in other institutions worldwide. I am a Collections Technician for the Pacific Collection Access Project. 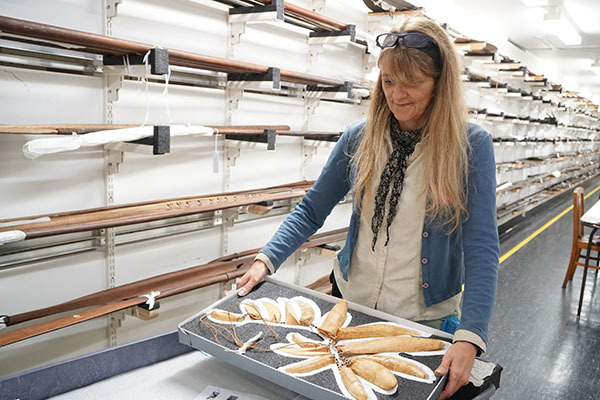 My focus is to update the Museum's database using a range of resources such as working together with knowledge-holders and undertaking research for each of the object types. I recently graduated from the University of Auckland with a Master of Arts in Museums and Cultural Heritage. I have many interests within museums, and I particularly enjoy learning about the stories of each of the taonga we work with. 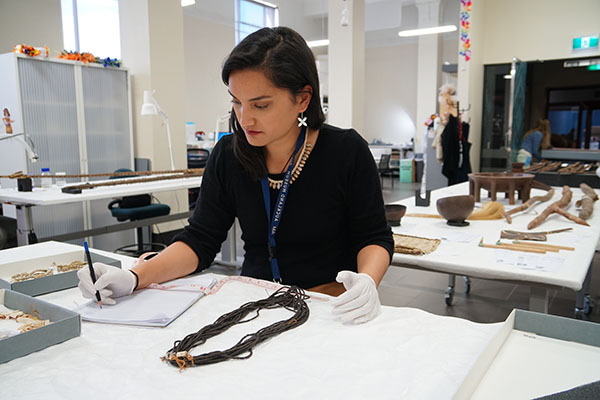 I have been working at Auckland Museum Tamaki Paenga Hira, since 2016 after having completed a Master’s degree in Cultural Materials Conservation at the University of Melbourne. Working with the collections from our Pacific neighbours is a privilege. Not only do I get to see how and with what the collection objects have been made, I also contribute to their lifespan by undertaking minor repairs and stabilisations in addition to cleaning them so that they are seen in the best possible light. I am of Samoan and European Scottish heritage and before joining the team, I studied Siapo (Samoan tapa) and its importance to fa’a Samoa (way of Samoan life) for my Master’s thesis. 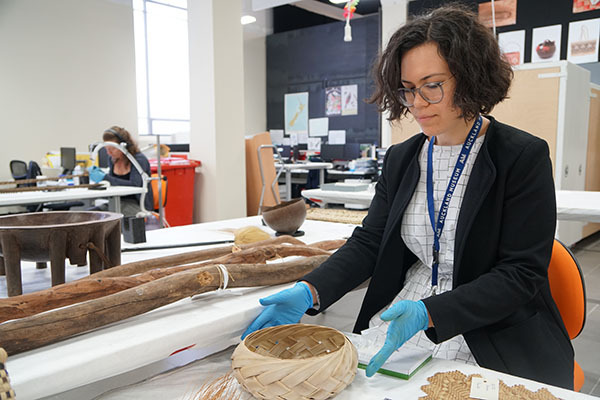 As a Collection Technician, I have been honoured with the privilege of working closely with source community knowledge holders that aid in enriching the records for the Pacific Collection since March 2018. Before working at Auckland Museum I studied textile design which lead to a post graduate diploma in Visual and Material culture and a Masters in Design. 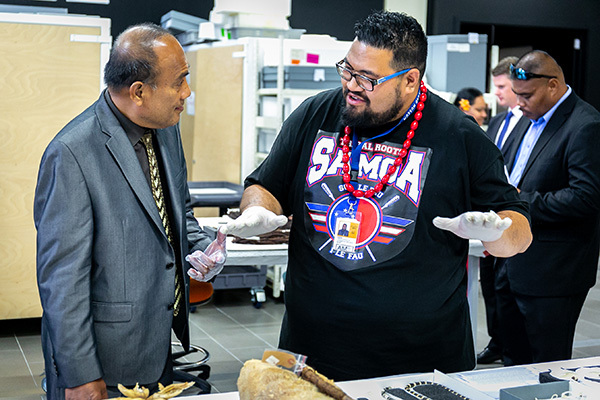 Working at Auckland Museum has contributed and grown my passion for Samoan textiles and the creative aspects that the Pacific Collection surfaces. 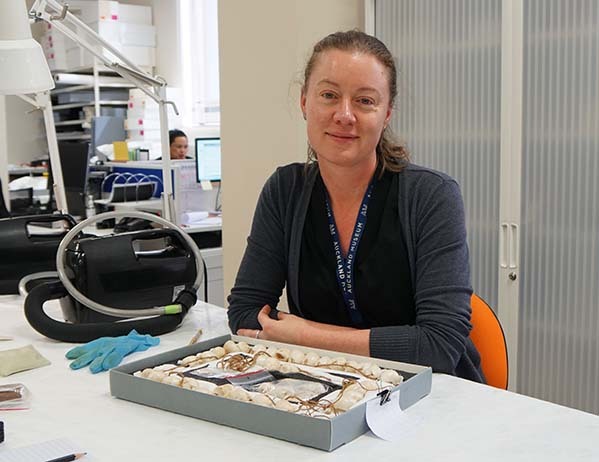 I come from an interdisciplinary background in English, History and Archaeology and have been Collection Manager, Human History at Auckland Museum since 2012. In this time I have always worked with the Museum’s incredible Pacific Collection as well as with the Applied Arts, History and Archaeology collections. I have been working with PCAP as Senior Collection Technician over the past year. I am an advocate for making collections open and transparent whilst incorporating processes to safeguard important cultural considerations. I strive to find new ways to really improve the accessibility of the collection for the public and for Pacific communities. I believe wholeheartedly in broadening traditional museum practises to be inclusive of richer cultural contexts and that we must answer to the changing nature of collection cataloguing for meaningful online engagement. I am a French born New Zealander, raised in Paris where I studied Fine Art and held my first art exhibition at 17 years old. I also worked in advertising and on movie sets making special effects. When I was 21 years old I backpacked for over 6 years visiting more than 23 countries before I stopped to live Auckland where I exhibited art and continued travelling to the Pacific Islands. I have worked in Auckland, Rotorua and Wellington as a freelance artist, Gallery Director and mentor to young New Zealand Artists. I have worked at Auckland Museum Tamaki Paenga Hira since 2008, as a visitor host, then with the Display Team and now with the Pacific Collection Access Project as Storage Technician, where I managed to develop the Auckland Museum/PCAP Recycling scheme for museums and cultural centres mainly in Aotearoa and the Pacific Islands. This has included delivering workshops to staff at the Fiji Museum and the Taoga Niue Museum, so far. I am responsible for the overall delivery of the project, leading the project team and reporting progress through to the Museum’s leadership team and the Pacific Advisory Group. Through my role I also get the opportunity to help host the many visitors from Auckland’s Pacific communities and beyond who have been through the project and engaged and connected with their collections, plus I have had the privilege to be present to hear the wonderful contribution of the Cultural Knowledge Holders who are working with the team to enrich the Museum’s records. Prior to working at Auckland Museum I have had a career in local and central government as well as the NGO sector. I was born in New Zealand, raised in American Samoa (Pagopago) and my parents come from Tonga. My mother is from Taunga, Kapa, Falevai, ‘Otea Vava’u and my father hails from Niua Topu Tapu -Tungua, Ha’ateiho, Veitongo Tonga Tapu. My role as a Community Engagement Facilitator is to connect the project with the Pacific community. My elders have always been encyclopedias of knowledge and I am honoured to have a job that facilitates the sharing of these stories onsite, offsite and online. My role is to “tauhi va” or ”teu le va” in a way that makes our community feel comfortable and welcome in a place where their ancestors' koloa tukufakaholo or artefacts are stored. 'O le Ala i le pule o le Tautua’ - In order to lead one must serve. Talofa lava! I am a NZ born Samoan – I come from the villages of Lepa/Faleasi’u/ Leulumoega/ Solosolo/Leififi and Faala in Savai’i. 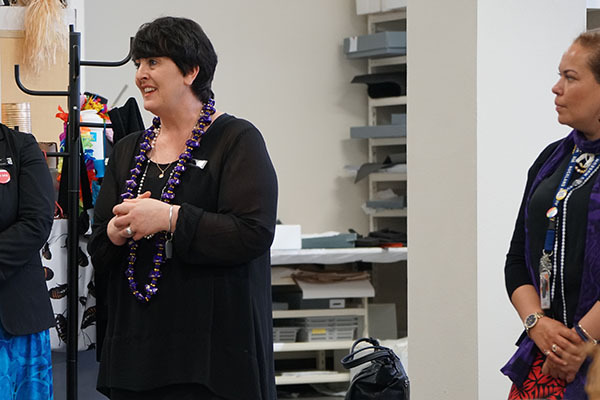 My role is to help connect tangata Pasifika to the vast Pacific collection that the Tāmaki Paenga Hira holds. 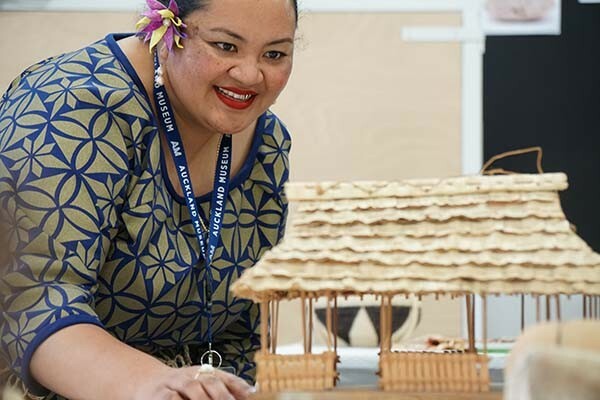 A key part of my mahi is to work with communities to find cultural knowledge holders who are able to share their stories and expertise to help improve the Museum’s understanding and knowledge of the Pasifika Measina (collection) with love and respect.